High on your list of must-see places in Taiwan have to be the iconic, historical and charming old towns of Keelung, Jiufen (九份) and Shifen (十分). They are rich in old world charm of a bygone era and have some of the best and atypical eateries in the country. The vast majority of visitors book coordinated tours to visit these towns, but it’s not that difficult for the independent traveler to get to see them without being herded around like cattle! It’s pretty straightforward to organize yourself and it is what we described to do ourselves, so read on and see how simple and stress-free it can be. 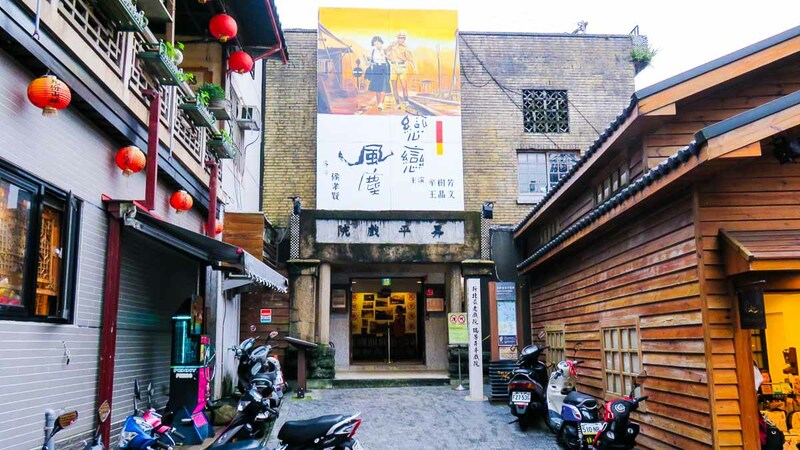 Nicknamed ‘rain city’ is a great place to begin your exploration of the beautiful North Coast, which includes spots such as Yehliu Park, Ruifang, and Japanese-style gold-mining town Jiufen. Don’t forget your umbrella ;). Keelung has some great events and festivals (check dates online) and probably the most spectacular of these is the popular “Ghost Festival” that runs normally around August or September depending on the lunar calendar. The city lights up with parades, fireworks, and red lanterns and things to see include folk-art performances and the release of burning water lanterns to light up the waterways for the lonely souls trapped there and guide them to land. The city is also known as an inexpensive place to eat and the night market is a great place to experience this with its fried sandwiches, cream crab, and famous Pao-Pao Shaved Ice (泡泡冰 Pàopào Bīng), available in an insanely amount of flavours from a few shops located near the intersection of Rensan and Aisi. It’s a really popular place so be prepared for crowds and queues. From our hotel, we used Youbike going to Taipei Bus Station and took Bus 1800 going to Keelung City. By Train Go to Taipei Main Station and take a Local Train (區間車) on Taiwan Railways to Keelung Station. The price of the ticket will be NT$41 and generally, leave every 15-20 minutes all day. By Bus The bus from the Kuo-Kuang Bus company just outside Taipei Main Station (台北車站), Exit East 3 (東3) is the quickest way to get to Keelung. The price of the ticket is NT$55. Yehliu Geopark is a cape shaped area located in Yehliu Village of Wanli District, just an hours drive from Taipei City. It is famous for its amazing eroded rock formations such as the Queens Head and is probably the major attraction in Taiwan. As well as boasting an ecology reserve and Taiwan’s first marine park, Yehliu has some great walks including one that takes you to the top of a cliff offering an outstanding 360-degree view of the North Coast and the Pacific Ocean. The marine park (Ocean World) features acrobatic dolphins, whale, and seal shows as well as the opportunity to ‘walk underwater’ with a stroll through the 100 meters long transparent undersea tunnel. Sadly the constant erosion caused by wind and waves that have resulted in the spectacular rock formations are the ongoing cause of their delicate state, so please always follow the guidance rules and never touch any of the eroded rock forms (especially the Queen’s Head) and always stay behind the painted boundary lines. From Keelung City Port, cross the bridge and wait for Bus 790 in front of Family Mart. By Long Distance Bus: From Taipei West Bus Station – Terminal A (located at Taipei Main Station), go to the KuoKuang (國光) window and purchase a ticket for NT$96 to Yehliu Geopark (野柳地質公園). The journey takes around 90 minutes, and the bus will drop you on the main road just outside the park entrance. Walk down the lane on the left side to enter. By Shuttle Bus: Ride comfortably in a shuttle bus from Ximen to Yehliu, followed by the Ying Yang Sea, 13-Layer Remains, Golden Waterfall, Jiufen (九份), and Shifen Old Streets (十分老街), leaving at 9AM and returning at 17:45. By North Coast Shuttle Bus (from Tamsui (淡水, Danshui) or Keelung): Take the North Coast Shuttle Bus NT$200 all-day unlimited rides from either MRT Tamsui Station or Keelung Railway Station. This is another really great place to visit in Taiwan as this old mining town is said to be the inspiration for the setting of the animated film, Spirited Away, which I happen to love. A bit of a downside is that you have to travel for at least two hours from Taipei just to reach the town, so hope you will have the time. Along the narrow alleyways, you can find a great variety of shops – souvenirs, general nick-knacks, cafes, and lots of places to eat as Jiufen is considered by many as a top food location. ; there are souvenir shops, stores that sell accessories, cafes and tea houses, and lots of food establishments, as Jiufen is considered by many as yet another top food location. Jiufen was primarily developed by the Japanese in from 1893 after they discovered gold there and their architectural influence is still very obvious although probably the most famous spot in Jiufen is this teahouse building decorated with red Chinese lanterns! Built in 1934, Sheng-Ping Theatre 昇平劇院 was one of the first film theatres in Taiwan. 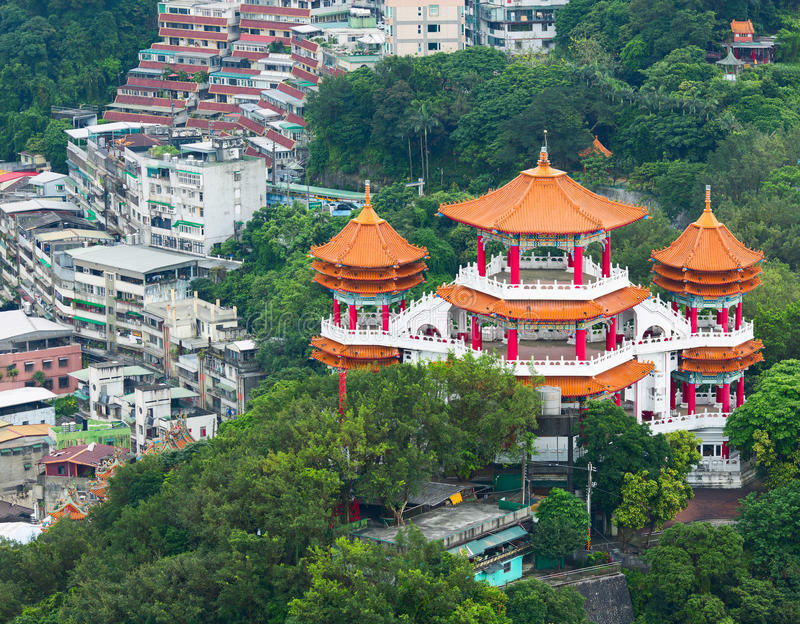 It was closed in 1986 as the Jiufen population had seriously declined but reopened and restored in 1989 due to exposure in a major Taiwanese film about it. The theatre is also showing reruns of A City of Sadness at certain timings of the day, so if that floats your boat be sure you visit. The Ah Mei Teahouse is another iconic landmark that you might recognize from Hayao Miyazaki’s 2001 movie, Spirited Away. It’s a great photo opportunity locating and it can be a bit of fight to get the ideal shot as it is very popular and always crowded. Skip the line and get fast-track entry to Amei Teahouse, one of Jiufen’s most iconic structures. Enjoy oolong tea and classic Taiwanese snacks in a traditional tea house with a breathtaking mountain view. From Yehliu Geopark, we took the same bus going to Keelung City and took a train from Keelung City to Ruifang Station. There’s no direct stop going to Ruifang from Keelung so you need to transfer to Badu Station. From Ruifang Station, walk to the bus stop near the Police Station and wait for the buses going to Jinguashi or Jiufen. No direct bus from Yehliu to Jinguashih or Jiufen. From Yehliu Geopark > Keelung (for transfer to another bus heading Jiufen/Jinguashih). Walk to Yehliu stop where you earlier disembark the bus. Across the road, just outside a convenience store, board Keelung bus #790 or #862 displaying destination “基隆” to get to Keelung Railway Station. Can use Easycard. Travel time: About 40 mins. By Train From Taipei Main Station (台北車站), take the train north to Ruifang Station. After exiting the station and facing the Welcome supermarket, take a left and walk 200 meters down Mingdeng Road. Next to the police station is a bus station (named Local Residents Plaza, 區民廣場) with routes 827 and 788 heading toward Jiufen. Please note that the bus stop next to the police station heads east toward Jiufen, and the bus stop across from the police station heads west toward Taipei. Route 825 provides weekend service only. From here, the bus trip takes roughly 15 minutes, and the fare is NT$15. It is recommended to take bus 1062 back to Taipei and enjoy some time at Raohe Night Market (饒河夜市). By Bus From MRT Zhongxiao Fuxing (忠孝復興), Brown Line BR and Blue Line BL interchange, leave from Exit 2 and from outside Sogo department store take bus route 1062 (Keelung Bus) to Jinguashi, alight at Jiufen. The ride is about 1 hour and the fare is NT$98. Be sure to get a good seat to enjoy scenic views of Northern Taiwan. Bus 788 is also available from Keelung. Jinguashi(金瓜石) is another former gold and copper mining town about ten minutes by bus from Jiufen. It’s famous for its mining history, its solid bronze statue of the Guang Gong and its POW camp for captured allied soldiers during WWII. Jinguashi is best visited as a side-trip from Jiufen (transport). It’s ten minutes by bus (number 788, every fifteen minutes) from the busy bus stop outside Jiufen Old Street. The Gold Building (museum) and Benshan Fifth Tunnel (gold mine) are closed on the first Monday of every month (except during or just after national holidays – see below). A must see is the restored the Benshan Fifth Tunnel (gold mine), complete with model Taiwanese miners setting dynamite or enjoying lunch from their bentos (Japanese lunch boxes). While a little contrived, it offers a taste of what life was like for the hard-working miners who supplied much of the metals needed by the Japanese empire. The Gold Building is essentially a museum on the history of gold in Taiwan and around the world and offers the chance to touch the world’s largest gold ingot at 220kg. It’s rumored that if you can lift it (with one hand) you can take it home. There are some great restored former Japanese residences, including a chateau built-in expectation of a visit from Crown Prince Hirohito, who never bothered to turn up! The park itself is free and always open. One of the less savoury aspects of Jinguashi’s history is Kinkaseki (the Japanese pronunciation of Jinguashi), which was a Prisoner of War camp, where over 1100 Allied soldiers, mostly captured in Southeast Asia, were forced deep into the mines to carry out work considered too dangerous or unpleasant for Taiwanese or Japanese miners. Conditions were similar to the infamous Death Railroad in Thailand and Burma, and prisoners were beaten with mining equipment if they couldn’t complete their allocated tasks. Many died from malnutrition and preventable diseases. The memorial was erected in 1997. Astride this temple sits a solid copper, 25 tonnes, golden-faced statue of the God Guan Gong, and although it is permitted to walk to the statue, you have to pass through the temple so always remember that it is considered a sacred place of worship. A short walk down from the Cyuanji Temple is the Golden Waterfall. The water collects a brownish hue from heavy metals (but not much gold) in the ground. (十三層遺址) Officially known as the Shuinandong Smelter, this abandoned thirteen-story smelter made famous as a backdrop for several movies. It’s possible to walk down to the roof of the smelter from behind the Cyanji Temple, however, it’s best viewed from the coast (also walkable from Jinguashi, a little past the Golden Waterfall, but easier with private transport). There are numerous Flue Pipes that’s used to carry the smoke and fumes to the top of the mountain, and they are believed to be the longest chimneys in the world. It’s not safe to enter any of the buildings or the chimneys. From Keelung to Jiufen/Jinguashih. From one of the staggered bus stops in front of Keelung Railway Station, board Keelung bus #788 displaying destination “金瓜石” The bus passes Ruifang Railway Station, then goes uphill to Jiufen. Can use Easycard. Travel time: About 40~50 mins. Disembark at Jiufen Old Street stop. The bus terminates at Jinguashih, about 2.5 km after passing Jiufen. Visit Jinguashih Gold Ecological Park first (if you are heading there too) as it has closing times. By Bus From Taipei, take the train north to Ruifang Station. After exiting the station, cross the street to the bus stop next to the Wellcome Supermarket and board the Keelung Transit bus towards Jiufen/Jinguashi. The bus trip takes roughly 15 minutes, and the fare is NT$21 during the week, NT$15 during weekends/holiday. By Train From MRT Zhongxiao Fuxing (忠孝復興), Brown Line 1 and Blue Line 5 interchange, leave from Exit 1 and take bus route 1062 (Keelung Bus) to Jinguashi. The ride is about 1 hour and the fare is NT$90. Be sure to get a good seat to enjoy scenic views of Northern Taiwan. Bus 788 is also available from Keelung. Shifen Old Street is in the Pingxi District 平溪区 of New Taipei City 新台北市 and is famous for its sky lanterns. Many tourists feel that Releasing sky lanterns is one of the lists of must-do items when you visit the Shifen Old Street and an attempt to be more ecologically correct, Pingxi is the only place in Taiwan where sky lanterns are allowed to be released due to its sparse population and high altitude. They come in all shapes, sizes, and colors and the colors represent differing auspicious meanings. The cost of the lanterns depends on how many colors the lantern has from 150TWD for 1 color to 200TWD for 4 colors. After you have chosen, they will unfold the lantern and clip it to a steel frame for you. You will be asked to write down your corresponding wishes on the lantern with the calligraphy brushes and ink provided. If you lack ideas about what to write, there are some handy Chinese phrases written on boards for you to copy! Once we are done with the writing, the vendor will open the flattened lantern and asked us to hold them for a photo session if you want and then it’s up up and away as you watch the peaceful assent of your lantern carrying your hopes and desires. Not wanting to ‘pour water’ on your floating dreams but do think about the fact that releasing sky lanterns has caused pollution to the environment. A sky lantern is only airborne as long as the flame stays alight and will sink back to the ground once the flame goes out. However, it may also land when it is still alight, making it a fire hazard. The flame source generally does not burn completely and may land in forests and buildings, causing pollution and even fires. 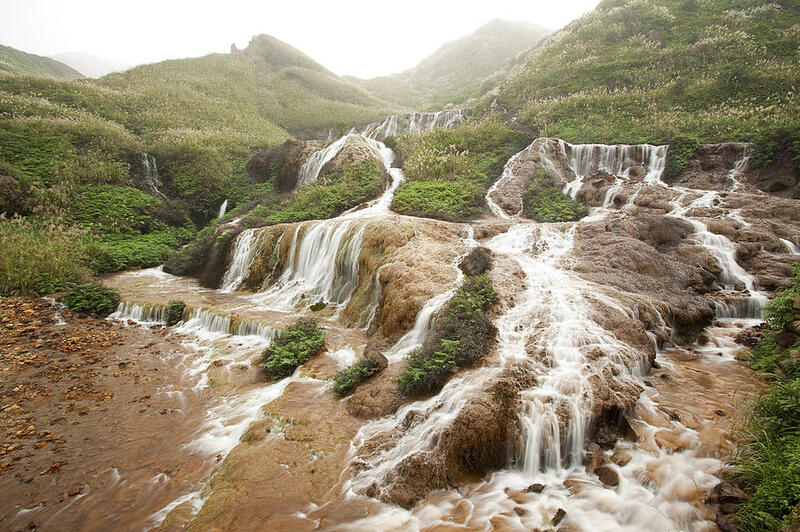 Most consider Shifen Waterfall to be Taiwan’s most famous and it has been nicknamed “Little Niagara” because the horseshoe shape mimics North America’s most famous waterfall. It’s not as tall nor as wide, at 20 meters high and 40 wide, located on the upper reaches of the Keelung River — though it is incredibly powerful. It is, however, insanely beautiful. NO admission/entrance fee is required: F R E E! The walk to the waterfall is a real beauty and includes crossing two suspension bridges, looking down ‘kettle pits’ (potholes) and admiring the winding river that seems comic book turquoise against the luscious green mountains; photo ops abound! The round trip to and from Shifen Waterfall takes about a 45-60 minute walk and there are some cafés here in case you get peckish (though after visiting Shifen Old Street, I’d doubt you are!). Make sure you go to the Observation Point Trail past the first major viewpoint of the falls — you can walk nearly all the way to the bottom of Shifen Waterfall where you’ll get the best view and photos (that is why you came, no?). From Jiufen take a bus going to Ruifang Station. Then, wait for a train bound to Shifen Old Street. Train intervals are every 1 hour so better plan your trip. Shifen Waterfalls is walking distance from the Old town. By Bus A shuttle bus service is available to Shifen, stopping first at Jiufen (九份) then on to from Taipei City at Ximending Youth Shopping District (西門町), leaving in the morning and returning before dinner. By Train From Taipei Main Station, take a northbound train (except Keelung-bound trains) towards Ruifang Station. Transfer to the Pingxi Line (平溪線) and purchase a One Day Ticket for the Pingxi Line, NT$52. Timetable of trains going to Shifen Station from Ruifang Station vice versa. Timetable of trains going to Taipei City from Ruifang Station. For an authentic Taiwanese experience, you must visit Taipei’s oldest night bazaar – Raohe Street Night Market. This amazing market is a stone’s throw away from Songshan MRT Station, and sellers normally start setting up their stalls at 5pm, but the best time to drop by is around 7pm – where you get to catch the action in full force. We waited an hour to catch the next train going back to Ruifang Station. Then waited for less than 5 mins before the next train going to Taipei. We get off at Taiei Songshan Station (Green Line) then walk towards Raohe Night Market. By MRT Take the Green Line 3 to the terminal station Songshan (松山), exit 5. The night market entrance is just to the right across the street next to the temple. By Train From Taipei Main Station, take any local train northbound (區間車) to Songshan Station (松山), then locate MRT exit 5. The choices facing the gastronome are enormous, and it’s so difficult to choose exactly what to try as it’s all so good! but don’t leave without trying a cup of the famous bubble ice, which comes in a range of fruity flavors, whipped up to order. Hi, ilang oras ninyo nacover yung trip? Nagiisip ako kung magKlo-klook eh parang ang rush kasi ng nasa tour group. Thank you. Whole day po ee mga 9-10pm na ata kami natapos sa itinerary na yan as we do it DIY talaga and masyado matagal waiting time namin sa mga train ride (di kasi namin alam sched before). Hi, thank you. 🙂 Pag-aralan ko kung pano kapag Jiufen, Shifen falls and Shifen old street lang hehe. Sobrang helpful yung blog mo keep it up po. Hi po! Just want to ask what you used to pay while exploring on this day(bus 788, 1062, train)? Pwede po ba ung easy card or its a different card that we should use? Super helpful! Maraming salamat! We followed your directions via bus and train. It was a success haha. Keep it up! i love your blog! i’ll be going there on february 2019! kaso natatakot ako mag travel but i’m going to use your itinerary for the guide thank you so much! Good thing I was able to read this before booking for a tour haha! Thank you! Good thing i came across your blog. Very detailed information. Was just curious tho, can we do it like Taipei-Yehliu-Shifen-Jiufen-Taipei? Yes! It is possible that is what we did but you need to wake up early and you’ll finish late. Cons of doing this in DIY way is that the train rides. Waiting time is every an hour so be mindful with the schedule so you can squeeze all the places in your itinerary. pwede naman po if gagamitin niyo lang siya panshopping tho if kapag sa mrt or bus or bike need tig iisa po. I can use Taipei unlipass going to Keelung City + Yehliu Geopark + Shifen Old Street + Jiufen right? Hi, im planning to get the taipei unlipass. Will I be able to use it going on the buses/mrt going to these places above? sa klook po ba to? Im confused kasi kung yung easycard na tinatop-up ang iaavail ko or yung taipei unlipass. If 1day city tour and 1day for this keelung-yehliu-jiufen-shifen lang po itin ko, which is better? thank you! hope you enjoy taiwan! happy travels! Did you try Klook or you went on your own?